Citation Information: J Clin Invest. 2018;128(7):2927-2943. https://doi.org/10.1172/JCI120481. TEM8 is overexpressed in human tumors. (A) Rabbit anti-human TEM8 mAb was used to stain TEM8 in FFPE sections of HT29 tumors grown in Tem8 WT and Tem8-KO mice. Scale bar: 100 μm. 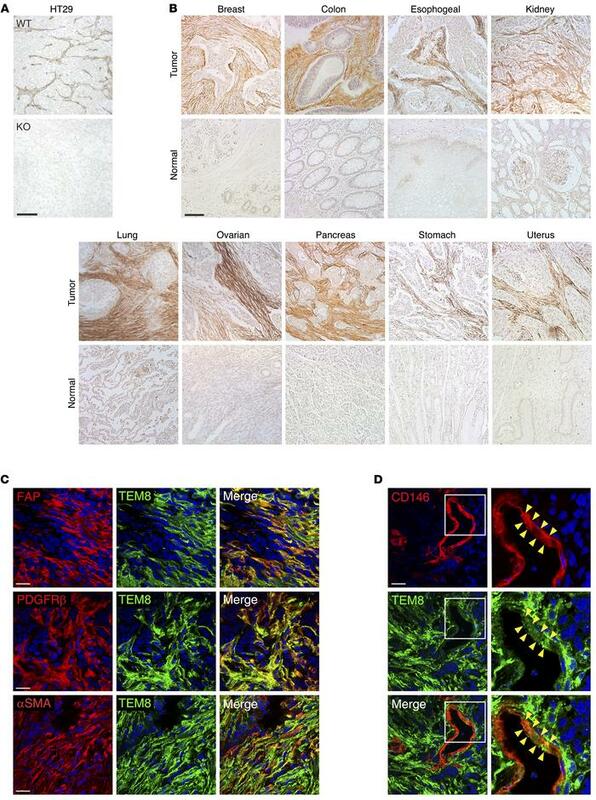 (B) IHC was used to evaluate TEM8 expression in multiple human tumors or corresponding normal organs. Scale bar: 100 μm. (C) Co-IF staining of human colorectal tumors for FAP, PDGFRβ, or α-SMA (red) and TEM8 (green). Scale bars: 20 μm. (D) Co-IF staining of human colorectal tumor for CD146 (red) and TEM8 (green). A double-positive endothelial cell is highlighted (arrowheads). Scale bar: 20 μm; original magnification, ×40 (insets in D).